As you know from “VW Beetle, aka, The Bug” I owned a bug for 38 years and would probably still be driving it had my sister never come to visit me. During that visit I loaned her my VW and borrowed a brand new, just delivered, hot car. Remember your first roller coaster ride – the terror you felt as you slowly inched toward the top of the first drop and the thrill as you zoomed down, hair flying, eyes wide, fingered clinched around the safety bar. That was my feeling. I had in my hands the steering wheel of a 200 horsepower street missile, an increase of 150 horses. I was going to go fast. I was going to go zero to 60 in a 7.9 second. Now I could drive in the fast lane, pass cars, go the same speed up hill as on flat ground … I was in car heaven. I hungered for one of these machines. But, I wanted to own a home and there was my children’s education to consider. And, did I really want to empty my savings? No! However, I could start putting money away for the day when I could go zero to 60 in my own car. And that day arrived, 25 years later. On a cloudless, crisp fall day, with my daughter in the passengers seat, I drove off the car dealer’s sales lot in a fierce 400 horse power … Black … Convertible … Corvette! Remember the driveway length on-ramps where the Bug played bumper-cars, well, that is no longer an issue. When I push the gas pedal the Corvette responds and I just slide neatly into the traffic. My first road trip was a visit to Aunt Judy. In pre-Vette days I would watch every cow and see individual fence posts as I drove the two-lane country road. In a car that will go from zero-to-60 in 4.3 second, most of the countryside is a kaleidoscope. Yes, I have the need for speed. I love taking the tunnel that connects Hwy 92 with 280 as fast as my stomach will let me. This tunnel is perfectly banked and one day I came out of it to five empty lanes, an open invitation to see just what that car could do. But, that blank canvas was quickly filled with a red flashing light. Another new experience – my first speeding ticket! So, I decided Driving was more than just going fast. The hills here have serpentine roads. In the VW I took the curves with precaution. In my C6 I take those turns with surgical precision and “pull some G’s”. This car is a gecko – it just hunkers down and sticks. But I must confess, on a warm day, with the top down, my hair in a ponytail, I just gotta see, can I handle zero to 60 in under … well, the car can, but me, I think I’m still a VW babe at heart. This entry was posted in Bucket List, Tech (cars, computers, social media, smart phones, video) and tagged boomer, C6, Corvette, Shinazy, storytelling, Vette. Bookmark the permalink. What? How could it take someone 38 years to get to 60 miles per hour … impossible! I remember in ’66 driving a friends ’65 red vet. At that time in my life it was amazing…….and we just went around the block! Then a year ago another friend took me in his ’68 red and white vet convertable. That’s a sweet car. 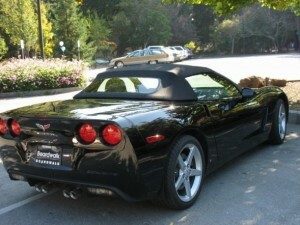 But riding shot gun in that black wonder with the top down and the music on high……..well it is a high!!! Thanks for the thrills Shinazy. Love the story and love your writing! For me, the sister who stole your last name when I was born… and was embarrassed to ride in that 1969 Bug after 1990, the best part of you owning the Vet is that parking attendants now give us VIP Parking Spots! !